No matter what time of year, one of my favorite ales to brew is American Pale Ale. There are lots of great commercial examples of APA, and many great recipes for APA on the web. Despite this, I thought I’d share my house APA recipe. It took many iterations to get this recipe just right for my palette, and hasn’t changes in recent re-brews. Late boil additions of a 50/50 split of Centennial and CTZ hops make for a citrus-y, dank hop aroma and flavor, while the small grain additions of Munich and Crystal 40L give enough malt backbone to support all those hops. Using good old US-05 at 68 F ferments this one very clean, keeping those hops forward and drying out the finish. Let me know in the comments below if you brew this great APA! Happy Brewing! Cheers! 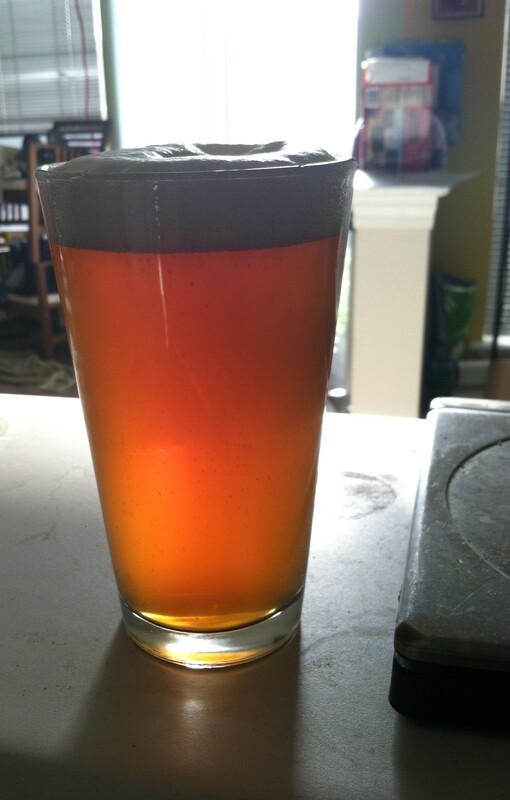 Pouring into a standard pint glass, this APA has a hazy, bright orange appearance was dense, white head. The aroma is bright with loads of citrus, along with the sort of aroma you always get with CTZ hops (dank, pine-y, complex?). Also, with a bit of age (~ 1 month), nice hints of malt complement the strong hop aroma. Taking a sip, strong bitterness is noticeable upfront, along with the citrus-y, dank hop flavor. In the finish, the bitterness lingers while the malt background keep it from being harsh, making you want another slip. Since this is my house recipe (and not my usual brew experiment), I usually don’t change it much with re-brews. I find this grist makes a good backbone for hop experiments (at least for me). Additionally, depending on my palette, I’ll drop the Munich addition, especially in IPA-sized batches, where I find the resulting brew too malty. Also, I’ve experimented in dropping the wheat addition, and found the resulting APA to be one-dimensional, so I tend to keep it (I like the bready-ness it contributes). Another observation (for the beer nerds out there), I’ve brewed this one with most Chico-based American Ale yeast strains (White Labs WLP001, Wyeast 1056 American Ale, and US-05), and haven’t found much variation between the differing brands in the final product. The only major advice I usual give at Zealots meetings is that I’ve found the Chico yeast strain to produce a citrus ester when fermented below 66 F, which I find undesirable when a clean fermentation is wanted, so I’ll push the fermentation to around 68-70 F to avoid this ester production. This was evident on a few occasions, notably the Palisades American Bitter single hop experiment.